Sunderland's Lee Cattermole plans to be more controlled in his tackling, without radically changing his style. He was shown a straight red card for a foul on Ahmed Elmohady in the his sixth dismissal in four years at the Stadium of Light. "I've lost my place in the team and missed three games and I can only blame myself," he told BBC Newcastle. "It's a fine line. I think I play the right way - hard, but fair. But at Hull I gave the referee a decision to make." The 25-year-old Middlesbrough academy graduate has made 187 Premier League appearances and forged a reputation as one of the toughest tacklers in England's top flight. He was signed by then Wigan manager Steve Bruce in 2008 and followed him to Wearside the following summer. Since then, the midfielder has received 34 cautions in 95 matches, but this term, his dismissal at Hull remains his only card in eight appearances. 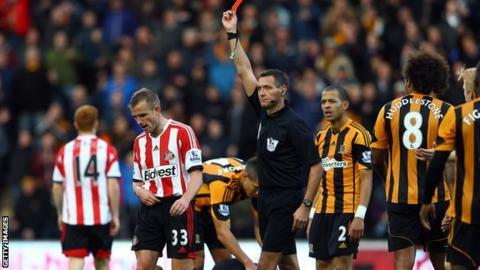 "I thought I'd cracked it this season to be honest, I really did not see a sending off coming," Cattermole continued. "I've tried to quickly move on and put it behind me because I've barely made a foul all season. "I'll stay fully committed, but maybe need to learn to stay on my feet and avoiding lunging for the ball when it's out of reach."